Slow Cooker Kansas City Sue’s Chicken features fall-apart tender chicken breasts with a sweet sauce with barbecue flavors, and this looks like the kind of dinner the whole family will like! Click here to see the Top 20 Slow Cooker Chicken Dinner Recipes! Click here to see the Top 20 Instant Pot Chicken Dinner Recipes! For Friday Favorites we spotlight past recipes that you may have missed, and this Slow Cooker Kansas City Sue’s Chicken from Mel’s Kitchen Cafe sounds like a great dish to make over the weekend. And this just happens to be a holiday weekend in the U.S., so some of you might have a little extra time to cook; enjoy! I think most of you know I have an enormous family and many of my 39 nieces and nephews are now adults, so I enjoy getting the younger point of view from them on all things related to blogging. Many of my nieces are young moms who help me discover family friendly food blogs, and Slow Cooker Kansas City Sue’s Chicken is from Mel’s Kitchen Cafe, a site I discovered when my beautiful niece Kara recommended it. The recipe for this slightly sweet tender chicken with barbecue flavors came from a Mel’s Kitchen Cafe reader, and I think this sounds like a winner! Mel says she serves the sauce on the side, but you could also simmer it to reduce if you don’t mind waiting a little longer to dig into this delicious chicken. 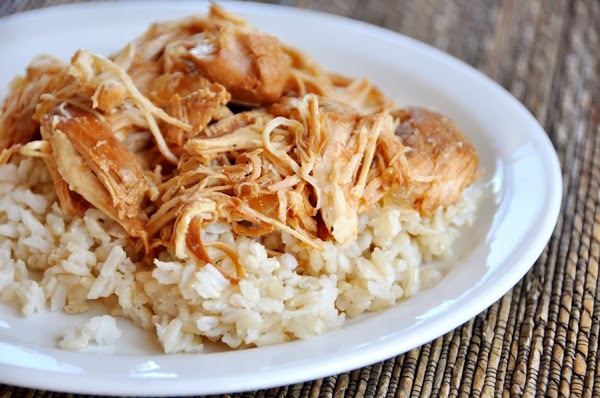 Get the complete recipe for Slow Cooker Kansas City Sue’s Chicken from Mel’s Kitchen Cafe. Lydia, I was wondering that as well, and I have to think it's because the cooking sauce ingredients are similar to what is in Kansas City barbecue sauce. But no idea who Sue is!